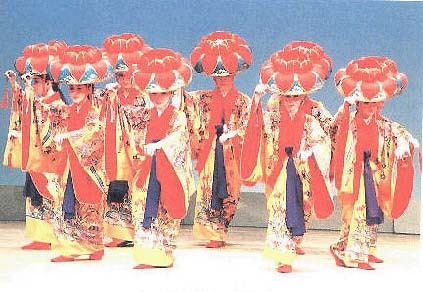 This graceful and elegant dance is characteristic of the unique, classical Okinawan dance. The costume consists of a flower dead-dress and of "bingata" - a kimono dyed in array of brilliant colors. Dancers sound the "yotsudake" (4 bamboo pieces) to the slow song of joyful performance.